Despite what appears to be a little acrimony over names, the Chinese and Myanmar governments need to get their monkeys in order. Some dedicated rangers have managed to acquire simple camera shots of what to the outside world, is a fantastic primate. So rare and in pristine rainforest, the black snub-nosed monkey is now established in the two countries, but hanging on to survival by a thread. Liu Pu, a forest ranger with a simple camera, is the instigator of this wonderful discovery, which equals the Myanmar discovery of the new species last year. In the recent past, mainland orangs and Gigantopithecus became extinct. But in isolated mountain valleys in rainforest, several unique species of primate, including five species of Rhyncopithecus, developed and survive to this day. Myanmar had a paper published in January 2011 to announce the discovery of this new monkey species. We recorded the details here in May. China has looked in similar valleys just to the east of the border and by happy circumstance, managed to find one of the rarest creatures on earth. The species is very shy, so Liu's achievement must not be underestimated. Near the village of Pianma on October 16th, 2011, the local Lisu people directed him to a piece of forest and he was able to take the first photographs. 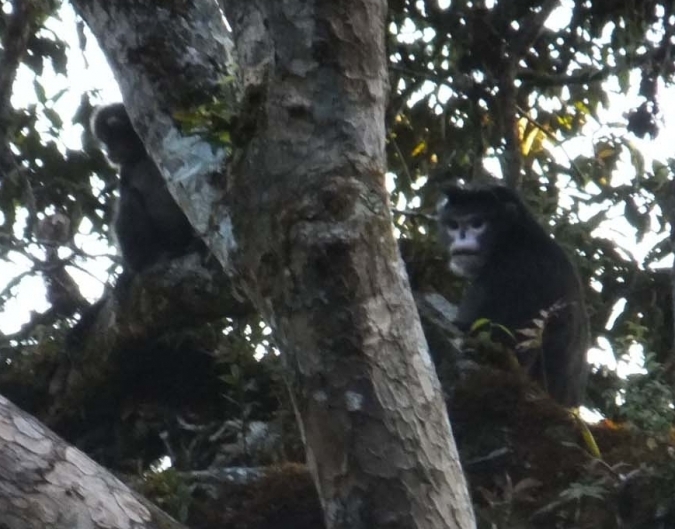 Above: The maximum 100 black snub-nosed monkeys predicted for the Chinese population possibly could include the equally small group in Myanmar. Extinction is only a breath away, when you consider the lack of genetic variation in such a tiny population. Resistance to disease is just one obvious major concern. Eventually good faeces and hair samples proved the animals to be Rhinopithecus strykeri, and not the slightly more common and very similar R. Bieti. 50km away from the population in Myanmar, the border territory in between must now be a possible area for further discoveries of new populations. With only 100 individuals, this useful step would create a base of knowledge from which we could organise conservation efforts over the two countries over thousands of km2. In February in Myanmar the threats facing the snub-nose and the intervention strategies possible were linked to the important funding mechanisms. As critically endangered on the IUCN Red List, a new reserve (Imawbum National Park) near Sawlaw in Myanmar was created for the snub-noses. Yongcheng Long, Frank Momberg, Jian Ma, Yue wang, Yongmei Luo, Haishu Li, Guiliang Yang and Ming Li wrote the paper for the American Journal of Primatology and executed the work in Liuku, Kunming and Djakarta in Indonesia, where Fauna and Flora International are based.